This past weekend my husband and I had the wonderful opportunity to travel to Boise, Idaho for a non-residential meditation retreat. This is our 4th year in a row traveling there for their winter retreat. 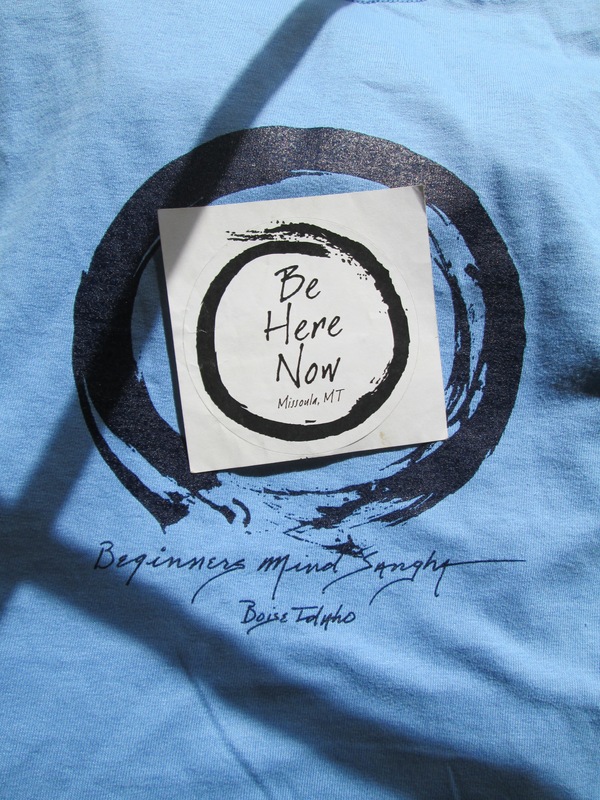 The sangha (spiritual community) there is called Beginner’s Mind and was founded in the early 90’s in the tradition of Thich Nhat’s Hanh’s Order of Interbeing, the same as our home sangha in Missoula. 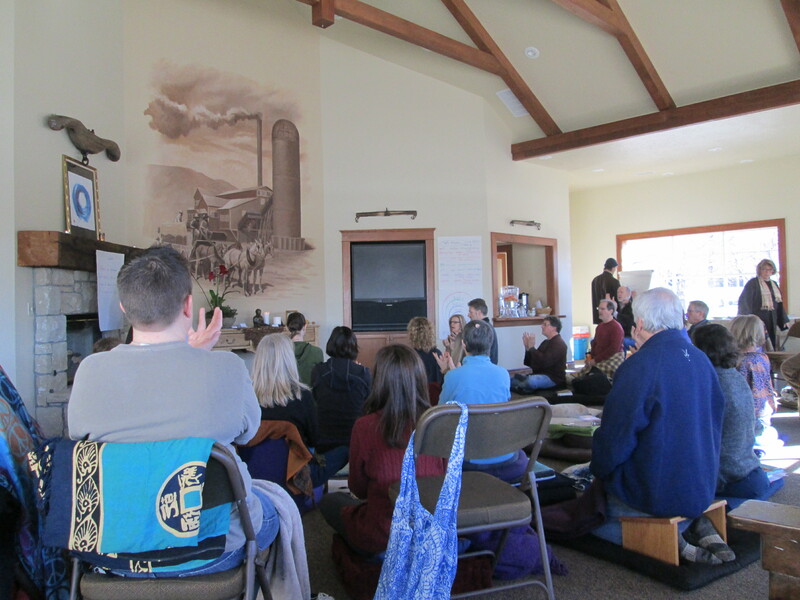 It is so wonderful to be able to cultivate connections and relationships with other sangha families and to practice together on the path of mindfulness. It takes about 8 1/2 hours to get from Missoula to Boise on a lovely scenic stretch of road through the Bitterroot National Forest, Salmon-Challis National Forest and the Salmon River Mountains. Idaho is similar to Montana in that it’s difficult to find a spot that’s not wildly wrapped up in beauty. Fortunately white roads and winter travels don’t deter us. With our 1994 all wheel drive Subaru legacy, touting an impressive 307,080 miles, we feel quite comfortable journeying out and about. After we were married we lived and traveled around the states in our old Ford van for a few months and found a love of the road, a place where we still feel quite at home. For me returning to the stretches of highways and byways that connect the largest cities to the smallest towns is like seeing an old friend, one I am quite happy to see and greet with a smile. We arrived in Boise for the start of their evening program on Friday night. As part of their retreat they had the visiting dharma teacher, Michael Ciborski, attend their regular practice night on Wednesday night and then Thursday night there was also a program from 7:00-9:00pm. The retreat then had a program on Friday night, all day Saturday and on Sunday until 4:00pm. Being a non-residential retreat means that there is no place to stay on the premise overnight where the retreat is being held so for the last 4 years we’ve been hosted by different sangha members in their homes. The Boise sangha is so welcoming, generous and hospitable and we have been so touched by the different folks who have taken us in over the years. This year two new friends offered to host us and they were so wonderful and took such good care of us. To take refuge in the sangha is to truly have a family wherever you go. We arrived in Boise with just enough time to grab something to eat and head to where the retreat was being held. At 7:00pm we started with sitting and walking meditation followed by a dharma talk from Michael. 4 years ago when we ventured out for our first winter retreat in Boise our motivating factor was to see our dear friend and teacher Michael Ciborski, who’s been coming to lead one of our two Montana Open Way Sanghas annual retreats for the past few years. Now as we’ve been making the winter trek we not only come to practice with Micahel but we come to see our sangha friends, which is so delightful! We need to practice joy and happiness. At first it may feel fake, like we’re not being authentic with our experience, and this is because our seed of joy is quite small within us. The seed of joy is within all of us but if we have not practiced watering it the seed may be very small. Many of us have practiced watering the seed of suffering much more so it is stronger in us. Our joy is like a tiny flower hidden in a large grassy field. Over time the flower will grow larger and larger. Both joy and suffering reside within and around us in every moment, we need to practice turning our attention in the direction of joy and happiness, because it is there too. Recognition – Cultivation – Realization (this is the process of working deeply to better understand ourselves and for developing a mindfulness practice). When we practice recognizing what’s happening we already reduce its power right away, transformation has started. It’s not the things, ideas, other people or our strong emotions that cause our suffering or attachments it is about how we hold onto them. (Are we holding gently with love and care or are we holding with fear, stress, and upset). 4 Graspings: Sense Pleasures, Views (example: right & wrong), Rules & Rituals, and The Belief in a Separate Self. The more we grasp & cling the more we suffer. “The tighter we hold, the further we are from life,” Michael Ciborski. We all have a garden of seeds within us that contain seeds of joy, peace, sorrow, anger, patience, kindness, fear, jealousy, ease, happiness and many others. Taking up mindfulness is like putting a gardener in the garden with our seeds. Someone to observe what’s going on and use tools to cultivate skillful seeds. The more we practice, the more we keep practicing. Let us practice also when we are not in the midst of challenge or strong emotion. If we wait until we are suffering to practice, the seed of mindfulness in our garden may be too small to be of any help in times of need. 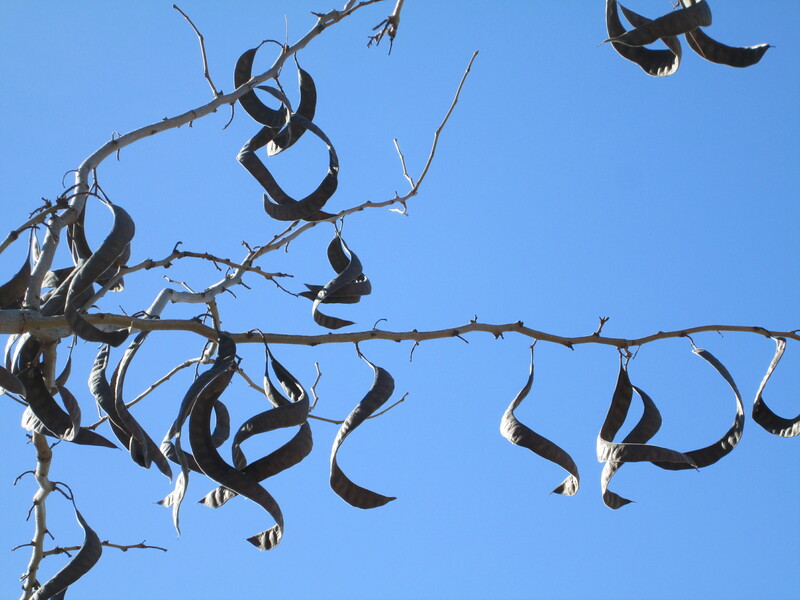 Our wholesome seeds in the garden have to do with interbeing and connection – to benefit all. Our unwholesome seeds in the garden have to do with being separate – to benefit self. Understanding ourselves does not happen on its own, we need to be willful and practice energetically. We need to get a hold of our mind. Our thinking is way out of control. Rarely do we think the thoughts. They are running around without our consciousness involved, jumping from one thing to the next. We are not in control of our thoughts. Concentration is developed by either elimination or relaxation. We need both to cultivate our practice – if we only do one we probably won’t be able to think very clearly. Elimination is to come from the outside-in. Relaxation is to come from the inside-out. “We connect with the world when we come home to ourselves (in the present moment),” Michael Ciborski, “To throw open the doors to the world, that’s what it is to come home to ourselves.” When we contemplate impermanence we are also cultivating letting go or our desire, our grasping begins to release. The eyes of impermanence, the eyes of interbeing and the eyes of no-self are all very connected – when we cultivate one we cultivate them all. 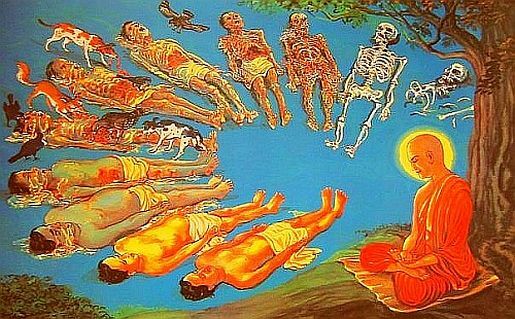 Cultivating impermanence, interbeing and no-self helps us to loosen our fears, grasping and attachments. We have a lot of ideas about our self that are not accurate or that we hold onto too tightly so that it causes suffering. Guided meditation exercise: I am not limited by this body, my body does not define me, it does not determine who I am. My name is ___, I’m ___ years old but they are not me, I am not defined or limited by them, they are conventional designations. Then we go through our schooling, upbringing, wealth, accomplishments, possessions saying to each that these things do not belong to me, I am not defined or limited by these things. Then we think about our family and friends saying to each that these people do not belong to me, I am not defined or limited by them. With this exercise we might think, “Who am I then?” or “Yes, that IS me!” This exercise is not to realize we are nothing but to see where we are grasping, where we are holding on too tightly, to help us free our grip. To calm down our grasping mind is the greatest refuge we have. When we are no caught in this or that, right or wrong, there is great joy. 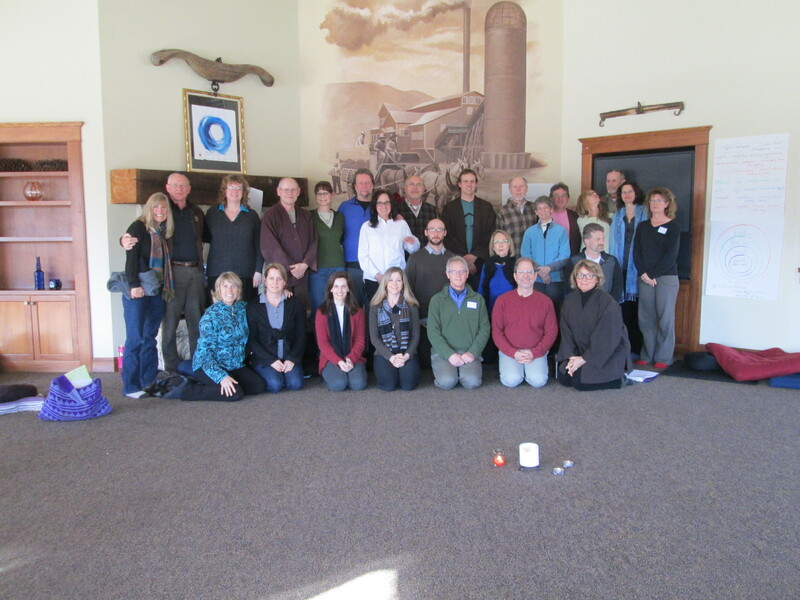 In the closing circle on Sunday I spoke about how in the past I saw attending retreats as simply something nice to do if I had the time but over the past couple of years looking deeply I see clearly that not only are retreats nice to do, not only are they important, they are crucial to my practice and my self-transformation. My gratitude to the Beginner’s Mind Sangha in Boise, my gratitude to my friend and teacher Michael, my gratitude to our hosts Steve and Shannon in Boise and my gratitude to Thay and the four-fold community of practitioners and my gratitude for the ability to wake up. Nothing is permanent. Everything is subject to change. Without change life would be impossible. I talk a lot about first seeing teachings on an intellectual level until our practice evolves further and we can transform our surface understanding into deeper levels of clarity and insight. This first step is not arbitrary and should not be under valued. It’s not only necessary but crucial for self-transformation to occur. It is human nature for our intellect to get involved first. Over time, with active practice, our experiences begin to color in the black and white outlines our intellect created and bring the teachings to life. Our intellect is like an instruction booklet and our practice is what comes to form when we follow the step by step directions. For example: let’s say we have an instruction booklet on How to Make a Clay Bowl. We read through the booklet and gather the materials necessary. Then we set out to learn techniques. Once we put the time and effort into working with the clay hands on we can create a beautiful bowl. That bowl is the product of our attention and diligence. Just as our authentic experience of the Buddha’s teachings are the result of our intellectual understanding. One cannot replace the other. Both are needed equally to bring about transformation. It is easy to say, “yeah, yeah, change is part of life,” but not yet fully get in touch with what the teaching of impermanence has to offer. When we practice to embrace change we practice to embrace the present moment. When we get stuck in our expectations, ideas, and stories we are caught in either the past or the future. Thay (Thich Nhat Hanh) has a saying: Go As a River. 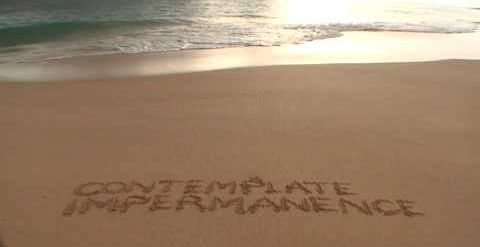 This simple saying is directly related to impermanence. To go as a river is to flow with the present moment just as it is. When we fight to swim against the river, which is to say the flow of the here and now, we are railing against change. When we think to ourselves, “this isn’t how it’s supposed to be,” we water the seeds of thinking that everything should forever remain unchanging. To cultivate a comfortability with impermanence is also to practice the beautiful art of letting go. Due to our want, and expectation, for things and people to stay the same we become ill equipped to skillfully handle differing life situations. We needlessly create more drama and suffering for ourselves. When we can begin to see that every single thing that happens, from a stranger giving us what we think is a dirty look to getting a flat tire to getting injured or sick, is a part of life and not separate we start cultivating the deeper lessons of impermanence. When we turn away from the simple truth that all things are subject to change we’re not altering the outcome of anything, all we’re doing is looking in the wrong direction. 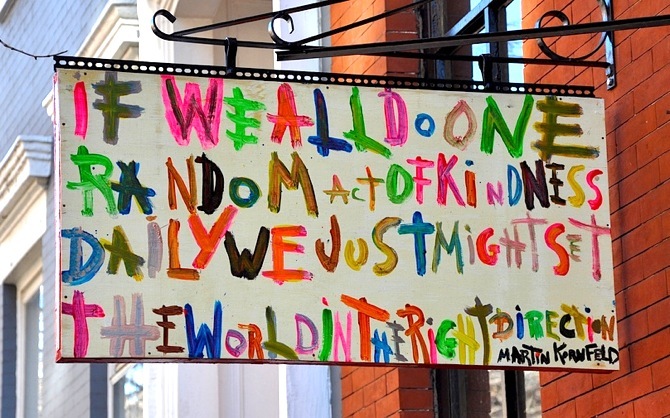 This week, February 11-17th, is Random Acts of Kindness Week. And while of course we don’t need a reason or a special week to perform small random acts of kindness and would certainly benefit from practicing regularly throughout the year, having a few days set aside with this intention can be a wonderful community motivation towards taking better care of one another and widening our sometimes, maybe usually, self-involved state of mind. When we take care of others we are also taking care of ourselves and when we take care of ourselves we are also taking care of others. This is the heart of the teaching on interbeing. We are all connected. To say that we are separate from someone is not entirely correct and along those same lines to say that we are the same is also equally incorrect. 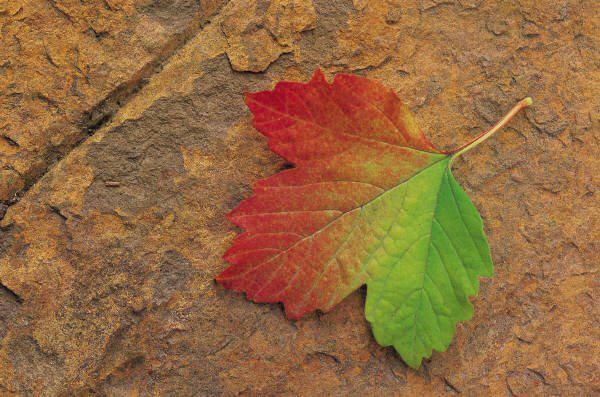 We are both the same and different in many beautiful ways. When we get in touch with our connectedness as a human community we are also getting in touch with our own true nature. It is easy to think that small acts cannot possibly add up to much and that it takes grand gestures to affect change. Just like a bucket sitting out in a drizzle gets filled up to its brim one drop at a time our seemingly small acts of kindness are not only extremely significant they ripple out much further then we might think. Please do not underestimate your impact on those around you and your environment. One smile can be like the sun shining through a thick gray sky, offer them freely and often. The more we practice anything the more we keep practicing. Let us practice kindness to ourselves and others everyday so as to cultivate understanding and compassion from deep within us. Yes, that’s right, I also put ourselves into the mix! Every practice we do starts with us. Often the most challenging person to offer kindness and care to is ourselves so please remember to practice with that person too! Send someone a hand written note of thanks. Buy a coffee for the man on the high street selling The Big Issue magazine. Give a compliment about your waiter / waitress to his / her manager. Stop and help someone replace their flat tire. Pay for the drinks on the next table at a café. Give a huge tip to someone when they least expect it. Hold the train door open for someone rushing to get in. Give up your seat for someone, not just an elderly person. Write notes of appreciation at least once a week. Talk to a homeless person and have a “normal” conversation. Pick up some rubbish in the road which would otherwise be lying around. Compliment a work colleague for their excellence. Recommend a competitor to a potential client. Give a piece of fruit to a delivery person. Tell all your family members how much your appreciate them. Leave a copy of an interesting book on a train / bus. Send a thank you note to a person who has helped you in the past. Pay for someone’s coffee at a coffee bar. Donate used books to a children’s shelter. Buy a flower for someone you don’t know. Do something to water your own seeds of joy. Collect food for your local food bank. Put a sign up in the back window of your car with a smiley face or other nice message. Remember to be kind to mother earth as well: use your own shopping bags at the grocery store. Give a treasured item you own away. I inherit the results of my actions of body, speech, and mind. 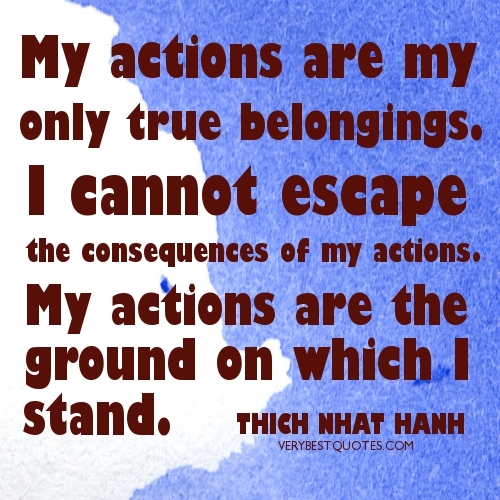 My actions are my continuation. 1) If I knew that my beloved one was going to die today, what would be the most important thing for me to say or do right now? Honestly, I don’t know. I would want to spend time with them, embrace them and let them know that it’s OK. It’s OK to die, it’s OK to leave me behind and that death is a part of life. I would want to meet them with a calm energy so that they can pass away without fear. And who knows if I could actually provide that or not, it’s hard to say. I would also want to help them tie up any loose ends that they felt necessary to take care of before they died. 2) What is preventing me from doing/ saying it right now? The only thing that prevents me from doing anything really is myself. It’s important to me to express my love to my friends and family regularly and to provide my love and support to them on a daily basis and to the best of my ability I do those things. There is no time like today to let someone know how much you value them. 3) What are some of the ways that I “hide” in the sense of shutting things out? The ways that I hide would be with netflix, the computer, and sugar. When I use them to hide what I’m hiding from is myself or a certain experience or emotion that I’m uncomfortable with. I devote a lot of practice to these areas and the more I become aware of this pattern the more I am able to transform those habit energies. It is a process. The first step in transformation is to see what needs transforming. It is easy to intellectualize the need to breathe. Let us take a deep breath right now. 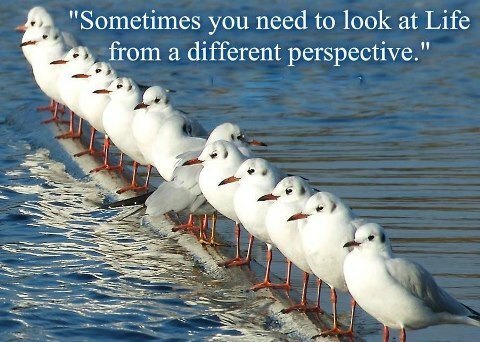 Good :) Now, let’s take another deep breath and this time pay attention to where it’s coming from. What part of our body moved the most as we inhaled and exhaled? Most, if not all, of the time we spend breathing comes primarily from our chests. When we take a large inhalation we can see and feel our chests rise as our lungs expand. This, however, is not the deepest breath we can take. When we practice to bring our breathing down even further into our stomachs we cultivate a more cleansing, grounding and fuller breath that can better nurture our connection to ourselves and the present moment. To practice deep belly breathing let us find a stable posture to rest comfortably in. It can be helpful to place a hand gently on our abdomen so that our minds have a physical prompt to help focus our attention downwards. As we breathe in through our nose let us allow our stomachs to rise slowly. 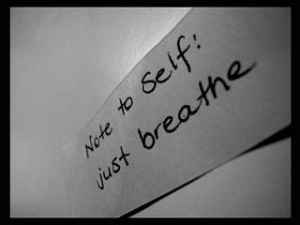 As we breathe out let us practice to keep our attention on our stomach and the sensation of exhaling. It can also be helpful to create a simple phrase to say so that our minds can stay present on our breathing. Simply saying: rising, rising, falling, falling can be a lovely practice as well. Breathing exercises reduce the workload on the heart in two ways. Firstly, deep breathing leads to more efficient lungs, which means more oxygen, is brought into contact with blood sent to the lungs by the heart. So, the heart doesn’t have to work as hard to deliver oxygen to the tissues. Secondly, deep breathing leads to a greater pressure differential in the lungs, which leads to an increase in the circulation, thus resting the heart a little. 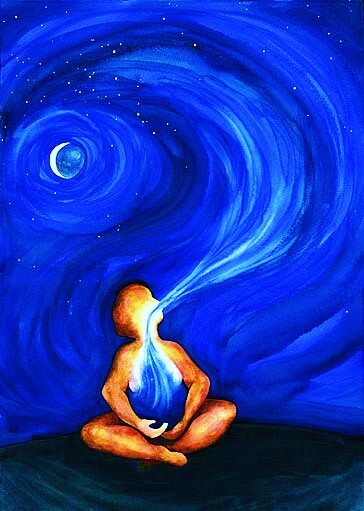 Thay (Thich Nhat Hanh) teaches that our breath is our anchor. With our breath we bridge the mind and body together. So often our minds and bodies operate separately. When we’re driving our car our minds may be thinking about what to make for dinner or stuck on something someone said that annoyed us. This is very common. How often are we present with what we’re doing while we’re doing it? Maybe never? With deep, mindful breathing our minds and bodies have the wonderful opportunity to reconnect with one another, to become friends, and to be in relationship with the present moment. What I most love and appreciate about deep breathing is that it’s a practice that we can infuse into any part of our day. Whether we’re sitting at our desk, on the computer, standing in line in the store, making dinner, or taking a shower we can come back to our breathing in and breathing out and shine the light of mindfulness onto everything we encounter and experience. 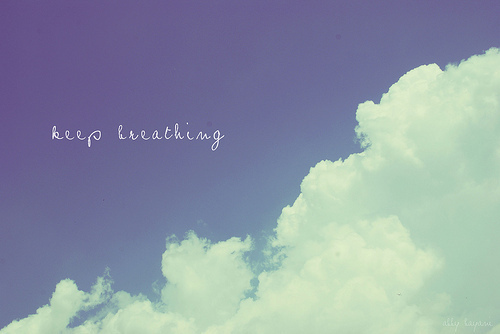 Deep breathing is not dependent on anything other than what we’re doing right now. 1) How have you created meaning and purpose in your life? 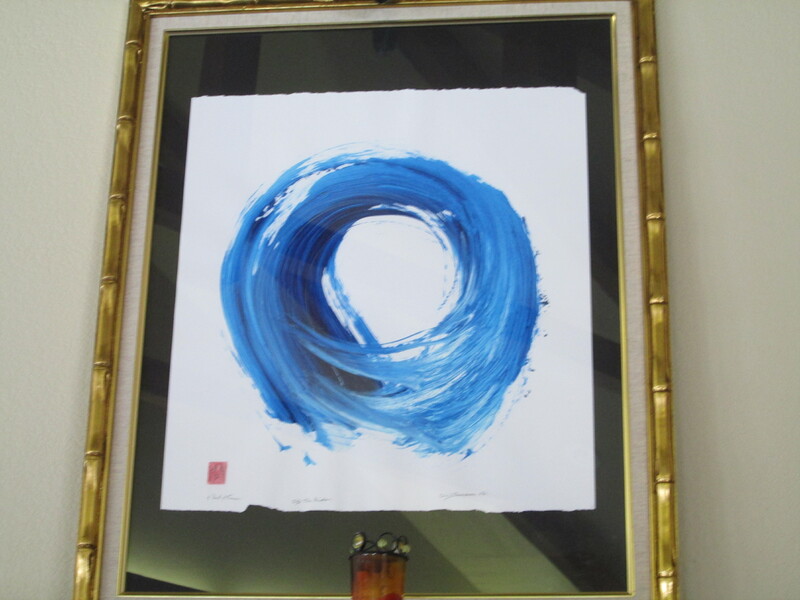 The first thing that comes to mind is sangha and the practice. I find meaning and purpose in my opportunities to create and nourish sangha. I cannot think of anything more important to do with my time than to learn how to be in relationship with myself, cultivate community and connect deeply with the present moment. 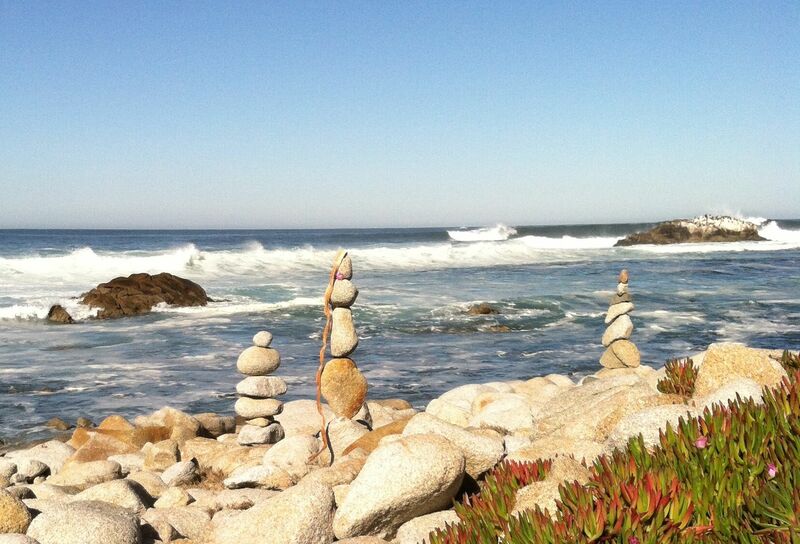 2) What activities do you find most meaningful? Which ones are difficult? Why is that do you think? I find sangha, meditation, mindfulness practice, getting together with friends and creating music as some of the most meaningful things I can do with my time. I would say meditation for me is the most difficult to do. 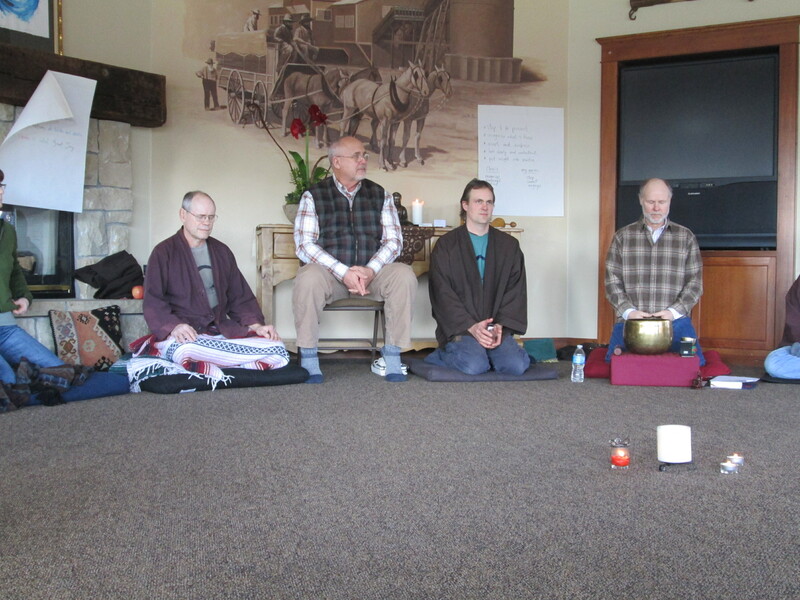 I sit every week with my sangha but I sit on my own very little outside of sangha. I haven’t created the discipline around it is why it is challenging. I haven’t decided to make it a priority. 3) What does it mean to you to be “useful” or “beneficial” to others? To see myself as not separate is one of the deepest teachings I think there is in this practice. When I work on the lessons associated with non-separatness I can benefit others on the most important levels. When I practice inter-being with myself, life situations, others, my environment and the here and now I am also practicing non-judgement, letting go, embracing things just as they are, compassion, understanding and an offering of gentle and confident energy at the same time in balance and harmony.